Southern BBQ Chicken , its lush, sticky and tangy and all the things you want to get finger licking good from your BBQ. Mash brown sugar, garlic, salt, and pepper together in a mortar and pestle to form a paste. Spoon paste into a resealable plastic bag. Add the chicken, coat with the paste, squeeze out excess air, and seal the bag. Marinate in the refrigerator for 8 hours to overnight. Heat oil in a small saucepan over medium heat. Cook and stir onion in hot oil until softened, about 5 minutes. Stir ketchup, vinegar, and Worcestershire sauce into onions; bring to a simmer and cook until flavors blend, about 10 minutes. Preheat grill for medium heat and lightly oil the grate. Remove chicken from bag and discard marinade. Cook chicken on the preheated grill until lightly browned on all sides, about 1 minute per side. Turn off one of the grill burners or move the coals and move chicken so there is no heat source directly below it. Baste drumsticks with the sauce and cook another 10 minutes; turn again and baste chicken with sauce. 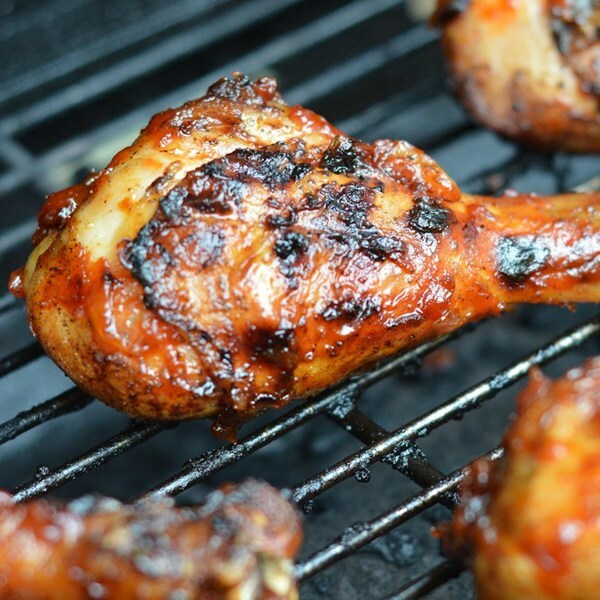 Continue to grill drumsticks until juices run clear, 10 to 15 minutes more. A thermometer inserted near the bone should read 165 degrees F (74 degrees C).